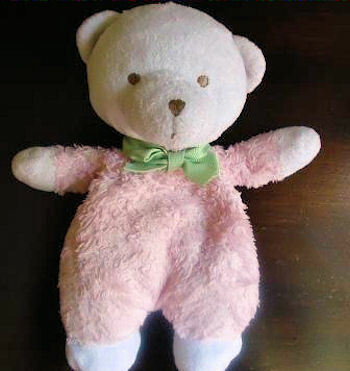 I’m looking for a white Garanimals bear in a pink chenille sleeper and wide green bow around his neck. If anyone sees our Teddy out and about, PLEASE let me know! Here is a Carters one that looks pretty close but it has a brown ribbon. Maybe you could replace it with a green one before giving it to her? Please look at this bear. It looks identical. Perhaps it was a child of mine by carters and not a garanimals as both are sold at Walmart. Did you ever look at the carters child of mine bear? Here is another.